Shopping for good gifts for clients can be quite a difficult task but it will always be a worthy one. You have worked very hard in order to keep your clients happy, so you have to do something to show how much you appreciate them and that you want to secure your relationship with them. You can stay on top of your mind with the help of some appropriate gift items or presents during all holiday seasons. You must let people know how much they are valued. And if you are looking for the best, appropriate and unique gifts or presents to send them this year, this article will surely help. The following mentioned are few tips for personalized corporate gifts for clients and some best gift ideas. Want to impress your client this holiday season? Buy them a nice and big business book. First of all, check what is selling in the market at this point. See what people are liking. If you know someone who loves to read a good book, ask them about what’s really happening these days. And they can hopefully give you an idea on the best business books available in the market. Buy a hardcover one, wrap it well, leave a note on top with your name and a nice message. They will surely be happy on receiving the present and if the book is a good one, they won’t forget you! Every state is known for its famous delicacies. For example, Bengal is known for its prawn curry and kosha mangsho and Gujarat for its thepla and achaar! You can see what is best in your city/state and send a box of food to your client with a note on why it is famous. Not only will they love the dish but also love you after this. Food is always a very effective way to impress people. This is one of the best business gift idea i.e to make and present a nice box of candies. Get the best candies available in town, wrap them in a basket or a hamper of some kind and present it to your client. They will be more than happy to receive it. Plus if your client is a sweet tooth, this would be the best client gifts that will make them happy like no other. Just make sure the candy comes with a huge variety. The more colourful it is, the more presentable it looks! A smart and unique gift idea we would advise you for your boss this season is some nice gym memberships. Clients tend to be very busy and often don’t have time for themselves. You can make them happy by sending them gym memberships. At least that would make them workout at least three times a week. If you have heard any of your bosses or clients speak about health and fitness, give them this! Not only will you show that you care about their health but also impress them during the last minute. Now isnt that a great thing? Got a boss who loves pizza? Give them the pizza gift! They will be more than happy to receive it. Plus if the Christmas season is somewhere around, you can always send two boxes of pizza with a personal note on festivities. We would also advice you to send some hot chocolate. Anyone would love to have cheesy pizzas with some yummy hot chocolate by their side during Christmas. This could be one of the best Christmas gifts for clients. You could make their day! There are several pizza coupons available these days. Pick them up now so that you can get it at a discount. A gift basket is also a pretty good idea for those who love presents. If you want to impress your clients with a whole lot of things, send them a gift basket. There are so many things you can get them in one. From gourmet cheese to wine and chocolates and coffee mugs or maybe some tea bags or creams… you should add whatever you think they will like. Hopefully it will impress all of them. After all, nobody will say no to a nice variety of sweets and treats. There is a reason why people love flowers. Not only it is a beautiful item to present but also comes with a great plant arrangement that will definitely impress your client. It is always wise to send them a bouquet. In that way, they will get to see a whole variety of flowers. I always add tulips, roses and orchids to my bouquet because they look so beautiful and pretty. Plus when they bloom, nothing can look more beautiful. It is definitely a sweet treat. Another way you can impress your clients is sending a suit case for travelling. Now everyone travels at some point of their lives so they all will definitely need something that would help them. A suitcase in that way would become a great option. Not only is the suitcase great for travelling purposes but also is a smart option for those who want to impress their clients with a good present. I gifted my client a suitcase once. I gave it to him just before he was about to leave for the holidays. He was beyond happy after receiving this. If your client likes to party, giving them a wine chiller this Christmas season will be a great Christmas gift idea. It would be one of the best Christmas gift he might have received. They can use it for their parties and drink wine as much as they like… all because of you! Not only is this a good present but also a very useful one. If you buy them a wine chiller, they will surely be very impressed. Try it once! In fact, we would suggest you to give them a bottle of white wine or port wine along with the chiller as it works so well. If your boss likes to have burgers, take them out to a nice café and serve them some nice burgers with fries and a coke. They will always remember you for it. Food is a great way to impress your clients and if you can do that, then there’s nothing like it. Just remember one thing! When you are taking him out, please don’t talk about business. Talk about the good stuff and the happy ones. That is also a gift in a way, don’t you agree? 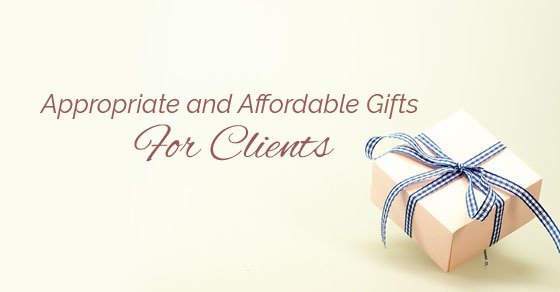 Now this is a very appropriate and affordable present for your client. Coffee mugs are always liked by everyone and people who love to drink coffee surely will not be able to say no to it. You should surely buy your boss one of these so that they can drink coffee as many times as they want in a day and think of you. Isn’t that what you wanted anyway? When you want your company to be prosperous and successful all year long, you have to make sure you impress the client. For this, you will have to see what are the subscription services at this point and what is available to the people. Every month the client will be given a gift of whatever they think is right, whether it is tea, coffee or any other products. You have to come up with a subscription service that works for them. You can personalize this present if you want or give it to them directly. Plus anyone would love to have monthly delivery at their doorstep. That would also improve your relationship with your client and make sure it is pleasant and positive all year long. A big bag of chocolate chip cookies often works well! People who love both chocolates and sweets are bound to be impressed with this one. Chocolate chip cookies can be baked, wrapped in nice wrapping paper and sent in a parcel to your client. In case you are meeting your client regularly, you can hand it over to them directly. Nonetheless, make sure you are giving them a whole box of it instead of a single packet. Make a good impression through the stuff you give. We all get highly stressed at work therefore it would be a great thing if we gifted someone a free spa massage pass. A nice spa massage pass will not only be a refreshing experience for your boss but also help them remember you. You may also join with them for the same session and make some conversation. It will always work wonders for them. Just make sure you are not involving business in the conversation whatsoever. Talk about things that are happy and friendly. If your boss likes something stylish, send them some cologne. Cologne will not only make them feel good but they will also remember you in that way. You don’t have to buy expensive perfumes. They are several affordable colognes available these days. You can actually pick one from these online shopping websites. There are plenty of them available. Just pick something you think that your boss will like and that will cover half of your worries. A good cologne never hurt anyone. Also remember to make it presentable by wrapping it with good paper with a nice thank you note written on top. If you want to help your client release all the stress that they are dealing with at this point, help them calm down with some stress releasing CDs which people usually hear at spas and other places they like to visit. Yoga cds are a great option and very impressive. You can buy your client some nice and well designed handmade jewellery bookmarks. This is best especially for those who love reading books, enjoy literature, have favourite bookstores and publishing houses. The book club presidents also matter and the readers also count along with it. You may also add some charms with the other items that come with some special meaning. You can find yourself a craftsman on etsy.com. Try presenting one of them to your client. They will be happy. In order to buy right corporate gifts for all your clients, it is very important to keep up with the best business relationships and it need not be a very stressful endeavour. You should try at least some of these appropriate presents for the holiday seasons so that they feel cheered up and all set for the upcoming year. If you have liked reading this post, let us know more about it in the comment box below. Also keep some questions for us. We would love to answer all of them for you!